A Doncaster-based investor and developer is backing the regeneration of his home town by acquiring two former commercial blocks in deals worth a total of almost £1.7 million. Paul Rothwell, Managing Director of Empire Property Concepts Ltd, will convert Danum House and St Peter’s House to create nearly 130 apartments aimed at workers who are being attracted to Doncaster by the growing numbers of jobs on offer. Jason Barnsdale, Managing Director of Barnsdales commercial and residential property specialists, said Empire’s investment could be a significant step in the regeneration of Doncaster town centre, with urban living capable of driving increased demand for commercial projects. Empire’s expanding portfolio stretches from Blackburn and Bolton in the west to three properties in Hull. Last year the company paid £1.85 million to buy Joseph Locke House, a government building in Barnsley which is scheduled to undergo conversion for residential use next year. The off-market purchase of Danum House for £900,000 was completed two months ago and now Barnsdales have secured St Peter’s House for Empire at a price of £785,000. Danum House is the former Co-operative building in St Sepulchre Gate and has previously housed retail outlets and a nightclub across five floors which provide 29,950 square feet of space. Empire is on course to convert the building to provide 78 one, two and three-bedroom apartments by next summer. 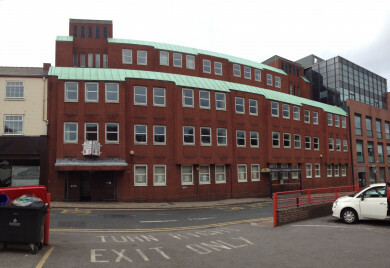 St Peter’s House in Princes Street, Doncaster, is a five-storey former government building of 3,000 square feet which will be converted by Empire into 51 one-bedroom apartments. Paul said: “Danum House is a landmark building in the centre of town and is ideal for converting the upper floors to residential use with commercial units on the ground floor. We expect the apartments to become available from summer 2018. “St Peter’s House is likely to be ready early in 2018. The conversion there is more straightforward and we have got a very good team working on it. We are confident there will be plenty of demand for the apartments because we’ve seen what’s happening in Doncaster and elsewhere. “In Hull job creation is being driven by City of Culture and renewables. In Pontefract, we converted King Charles House into 62 apartments which we filled in six weeks, with much of the demand driven by recruitment at Ferrybridge power station and Haribo. Jason added: “We know from the volume of deals and the quality of projects that we’re working on that things are really picking up in Doncaster. But it is taking some time for the benefits to reach the town centre, and that’s why these deals are so important.